Trusa Extractor Rulmenti 2 si 3 Ghiare INTERIOR-EXTERIOR cu Ciocan "CULISANT" 5.buc - ZIMBER TOOLS. 1.buc - Presa Extractor Exterior cu 2 ghiare. 1.buc - Presa Extractor Interior cu 2 ghiare. 1.buc - Presa Extractor Exterior cu 3 ghiare. 1.buc - Presa Extractor Interior cu 3 ghiare. 5 Piece Internal & External Gear Bearing Puller Set (ZR-36PSHG05) - ZIMBER TOOLS. Drop forged Chrome Vanadium steel puller arms with locking/gripping feature. 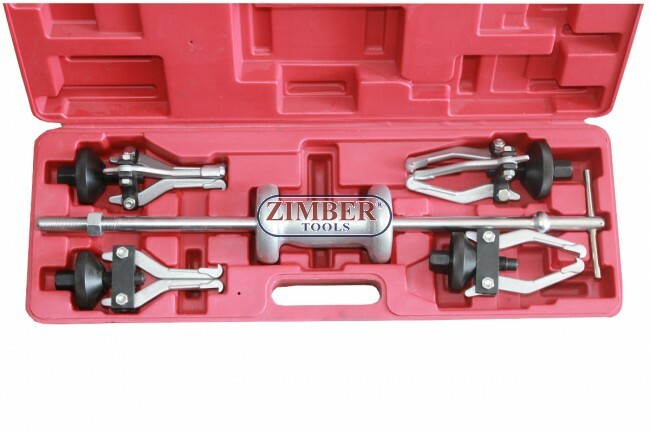 Set includes three sets of 100mm triple leg pullers with locking feature which clamps the jaws firmly inside/outside the gear or bearing. Small of internal puller 15mm-30mm. Large of internal puller 30mm-80mm.